Join us for a reception and exclusive preview of the prints for sale before Portland Fine Print Fair 2016 opens to the general public. 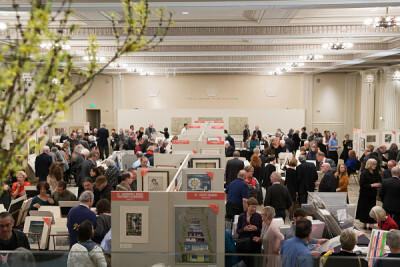 For one weekend only, browse and buy prints in the historic Fields Ballroom. Thousands of prints dating from 1500 to the present will be for sale from top art galleries from North America and Europe. These friendly and knowledgeable art dealers welcome your questions, offering an exciting opportunity for both novice and expert collectors to peruse and purchase original prints for their collections.